When graphed, the data in a set is arranged to show how the points are distributed throughout the set. These distributions show the spread (dispersion, variability, scatter) of the data. The spread may be stretched (covering a wider range) or squeezed (covering a narrower range). 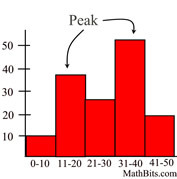 PEAKS: Graphs often display peaks, or local maximums. It can be seen from the graph that the data count is visibly higher in certain sections of the graph. 1. one clear peak is called a unimodal distribution. 2. two clear peaks are called a bimodal distribution. (Here, the term "mode" is used to describe a local maximum in a chart (such as the midpoint of the a peak interval in a histogram). It does not necessarily refer to the most frequently appearing score, as in the "central tendency mode". 3. single peak at the center is called bell shaped distribution. Note: A bell shaped graph (bell curve), is a frequency distribution that resembles the outline of a bell when plotted on a graph. Note: The graphs shown below demonstrate the shapes of various sets of data. The histogram, dot plot and box plot in each separate section represent the same data set. Symmetric (bell shaped) - when graphed, a vertical line drawn at the center will form mirror images, with the left half of the graph being the mirror image of the right half of the graph. In the histogram and dot plot, this shape is referred to as being a "bell shape" or a "mound". The most typical symmetric histogram or dot plot has the highest vertical column in the center. This shape is often referred to as being a "normal curve" (or normal distribution). Not all symmetric graphs, however, have this shape (see Symmetric U-shaped below). Symmetric (U-shaped) - as mentioned above, a symmetric graph forms a mirror image of itself when reflected in its vertical center line. Unlike the previous graphs, these histograms and dot plots have more of a U shape. Uniform - The data is spread equally across the range. There are no clear peaks in these graphs, since each data entry appears the same number of times in the set. Notice in the boxplot how each section is of equal length: min to Q1, Q1 to median, median to Q3, and Q3 to max. These graphs are also symmetric.